The Antrim senior hurling team has issued a statement vowing to back their manager Kevin Ryan in the wake of their relegation to Division 2A for 2016. The Saffrons' fate was secured with a surprise one-point, 2-16 to 1-18, loss to Kerry in a promotion/relegation play-off at Parnell Park on Saturday. The players held a meeting at the Antrim GAA offices in Hannahstown on Monday night. They expressed their full support for the Waterford native in a statement. "We the Antrim senior hurling panel fully support our manager Kevin Ryan," they said. The players also accepted blame for a poor Division 1B campaign, which resulted in seven successive defeats. The Saffrons have only won one league game during Ryan's three-year tenure. "We take full responsibility for our recent performances. Our relegation has hurt no-one more than this group of players. "We will strive to improve and move forward as proud Antrim hurlers towards championship." 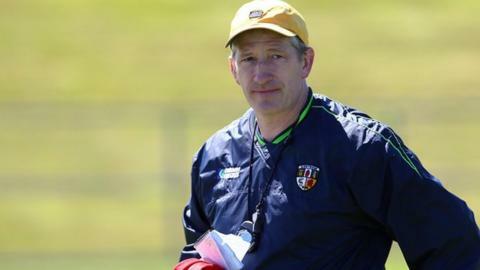 Antrim GAA Chairman Jim Murray also endorsed a decision made by Coiste Bainisti last night that they fully support the hurling management team and look forward to the Leinster Championship campaign. Ryan has previously agreed with Antrim GAA officials to stay in the role until the end of 2016. Meanwhile, it's understood that a number of players have left the panel including Barry McFall, PJ O'Connell and Jackson McGreevy.